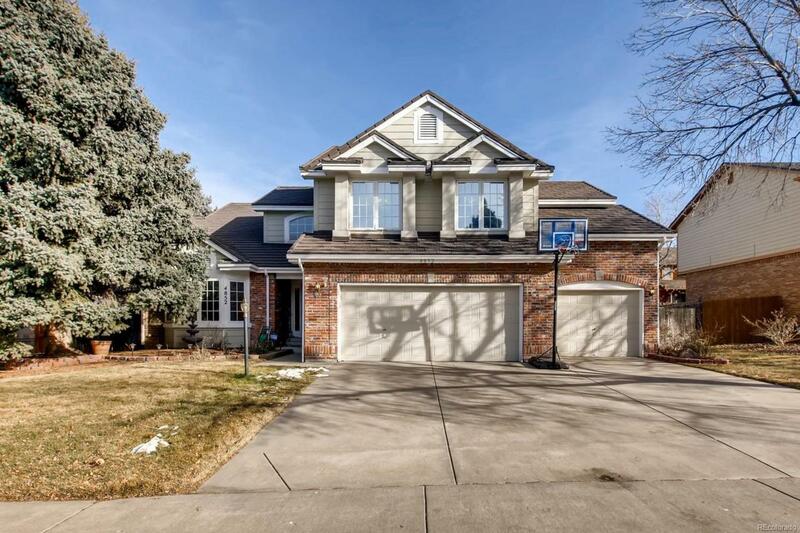 Beautiful and spacious two-story 5-bed 5-bath home with a finished basement in the prestigious Cherry Creek School District. Enter the home and step onto the marbled foyer. Large office/study with real hardwood flooring. Enjoy the open formal living room with plenty of natural light that leads into the formal dining room. Gourmet kitchen with marbled flooring, granite counters and back splash. Stainless Steel kitchen appliances with a gas stove and rimless sink. Ample-sized family room with a cozy-gas fireplace. Main floor laundry room. Walk up the curved hardwood staircase to the large master bedroom with a 5-piece bathroom, built-in shelving and walk-in closet. Secondary bedrooms with a Jack-n-Jill bathroom; plus another bedroom with its own private bathroom. Finished basement with an additional family room area, bedroom, full bathroom with a jetted tub, and additional storage. Landscaped yard. Enjoy the Tennis Court and Sagebrush Park. Near all conveniences. A must see! Offered by Steps Real Estate 102 Llc.